As we all may have seen on the news these past few days that Emmett Till’s accuser Carolyn Bryant came forward about what really happened in Mississippi on August 28th 1955. For the start of Black History Month, I want to focus on the story of Emmett Till. This story is very familiar to me. In 7th grade I created my history fair project on the lynching of Emmett Till. I was so moved by what happened; I forgot that I was doing a project. I ended up going down state in Springfield with my project. This really sparked my interest for OUR history. Emmett Louis Till was a 14 year old boy from Chicago, Illinois. He was known to be charismatic and the center of attention. His mother, Mamie Till was native to Mississippi but moved here with her family at a young age. She was fully aware of the deep rooted segregation in her hometown. In the summer of 1955, Mamie Till’s uncle Mose Wright traveled to Chicago for a funeral and suggested that Emmett and his cousin should visit him in Money, Mississippi. Mamie had to explain to Emmett before he left that the South was nothing like the North. There was no eye contact to be made with white women, no disrespect towards white men, it was strictly “yes sir, no sir” or “yes ma’am, no ma’am.” Emmett listened to his mother and headed to Mississippi in August of 1955. After a long day of picking cotton with Mose Wright, they drove up to the Bryant convenience store where Roy Bryant and his wife owned and operated the store. When Emmett bought a few pieces of candy, he allegedly whistled at Carolyn Bryant, wife of Roy Bryant. She immediately informed her husband and brother J.W. Milam. The boys ran from the store and drove as fast as they could back to their uncles home and didn't speak a word of the incident to their uncle. A few days passed and around 2:30am on August 28th, 1955, Bryant and Milam arrived at the Wright home demanding them to hand over Emmett. Out of fear, Wright gave Emmett over and didn't hear a word from them after. A few days later, Emmett’s body was found mutilated with a cotton gin attached to his neck in the Tallahatchie River. He was beaten, shot in the head and thrown into the river with a 75-pound cotton gin attached to his neck. His body was so unrecognizable that the only way to identify him was his father's ring his mother had given him right before he left to Mississippi. Mamie Till decided to have an open casket funeral for Emmett so that everyone could see that what those two white men had done to her son. Chicago funeral home A.A. Rayner followed Mamie’s order and left it open for the funeral. There were about 50,000 people who attended Emmett’s funeral and the site of his body was horrific. There were quite a few people who couldn't handle seeing his body and passed out. Shortly after the funeral, Chicago based magazine “Jet” ran the photos in one of their issues and that brought national attention to the his murder. Emmett Till’s murder sparked the Civil Rights movement. Emmett’s trial was held in Money, Mississippi with an all white, male jury. The trial was held for only 5 days and they were found not guilty. Many black people did not speak out about the trial in fear of being lynched. 62 years later, Carolyn Bryant, the woman who accused Emmett Till of whistling at her came forward saying that she had lied about what Emmett did. This was not a shock to many black people due to the long history of white women falsely accusing black men of sexual assault. It’s sad to know that many of our grandparents have lived through the Jim Crow and Civil Rights Era here in the United States. Listening to the stories my 88-year old grandfather has told makes it even more real. The suffering that black people have and are still enduring more than 60 years later proves that this is far from over. 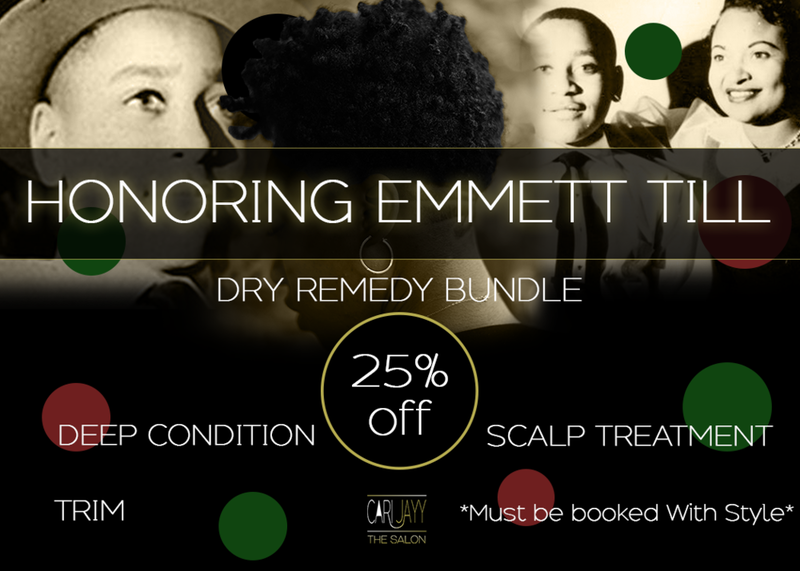 I’ve created a “Dry Hair Remedy” bundle that includes a scalp treatment, deep condition, and trim (Orig. $40) for $30. You will need to book a styling service along with the bundle. I encourage every single person reading this to really research our history. Our history extends beyond one month. We are such beautiful people (inside and out) and have influenced everything in the world. There is a reason why we are targeted among the masses. I thank you all for taking the time to read this. If you are interested in more detail of the Lynching of Emmett Till, I have linked a documentary below. I encourage everyone to watch.